Log home living is more than simply building a house made of logs, it is a complete lifestyle. Building a custom log home is all about focusing on the good things in life that make us happy and comfortable. 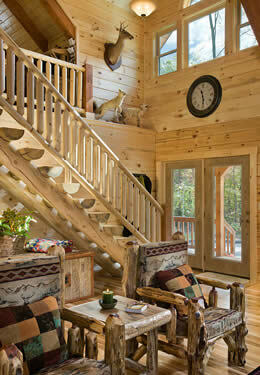 We wish to help you and others “experience the experience” of log home living in your very own log cabin dream home. Bear’s Den Log Homes has put together a network of highly qualified, licensed and insured contractors, lenders, and realtors in Central and Western North Carolina and Georgia to help bring this lifestyle to you and help you make your dreams a reality. We believe in using only the finest kiln-dried logs for our custom-built luxury log homes when it comes time to turn your plans into reality. Learning how to select the most suitable species of wood for log home construction has taken our craftsmen many years. From cutting and planning to notching and measuring, each step is vital to producing the perfect construction package, but perhaps none more so than properly kiln-dried logs. We start by selecting only the highest quality Eastern White Pine. We combine natural air drying and kiln drying in the manufacturing of every single timber to minimize movement, shrinkage, and settling in the timbers over time. The drying process produces a more stable log and tighter joints for the construction of your handcrafted log home. There are many different styles and sizes of logs for you to choose from, this is referred to as the log profile. From a flat-on-flat with a dovetail corner to a milled D-log with an inserted corner notch to the original chinked log to the round-on-round to name a few with many more log profiles to choose from. 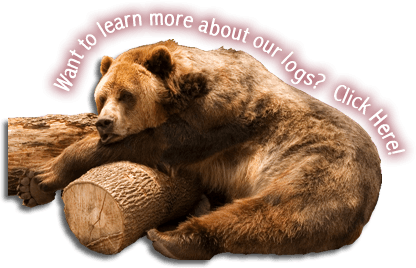 You can learn about all the different log profiles available at our Selection of Log Wall Systems. The exterior walls of your home can be one profile while you can choose another profile for your interior walls to get the perfect look and feel you are seeking. 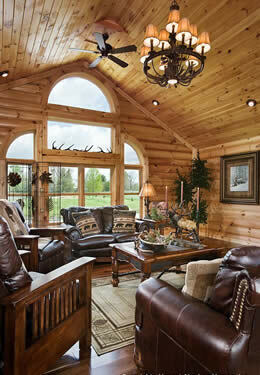 Bear’s Den Log Homes will build your log home to suit your lifestyle. “From start to finish, our venture with Bear’s Den has been a fun and stress free experience. We couldn’t be happier with our new log home.